Nothing’s to come easy in the coming weeks with a substantial amount of road commitments fixated in the heart of the team’s regular season schedule. 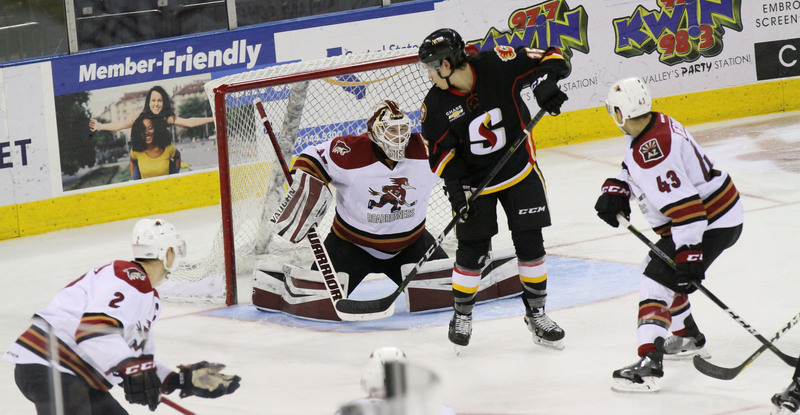 A monster third period catapulted the Roadrunners to a 4-2 win over the Stockton Heat Wednesday night at Stockton Arena. The team improved its road record to 9-2-1-1 with the victory, which is tops in the Western Conference. They’ve now won five of their past six games. Hunter Miska got the call for his 14th start of the season and put forth another solid performance in net, making 27 saves to earn his 10th win of the campaign. Stockton was the first team to strike, though, and they did so early via a Cody Goloubef shot that found its way through traffic from the point to give the Heat a 1-0 lead 1:46 into the contest. The Roadrunners entered the second period facing a light deficit, but evened the score when Jens Looke buried his fifth goal of the season 7:35 into the middle frame. Looke, upon receiving a pass from Michael Bunting as he fled to the front of Stockton’s net, shoveled a backhand shot past Jon Gillies to tie the game 1-1. He extended his point streak to three games with the tally, and has a total of four (1G, 3A) during that span. The Roadrunners broke things open in the third. Dylan Strome, just over a minute into the final frame, stole a puck from a Stockton defender in the offensive zone and turned to beat Jon Gillies with a shot high to the short side to give the Roadrunners a 2-1 lead. For Strome, it was his 14th goal of the season and his third in as many games. Just over a minute later, Conor Garland snuck a shot past Jon Gillies from behind the goal line to give the Roadrunners a 3-1 lead at the 2:12 mark of the third. Stockton’s Ryan Lomberg got the Heat back to within a goal with 15:19 left to play in regulation. 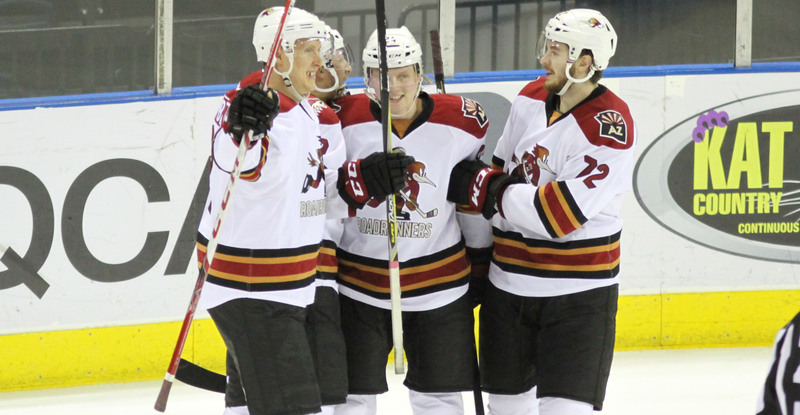 Michael Bunting buried an empty net goal with 1:09 to play to secure the Roadrunners’ 4-2 victory. With the win, the team’s record improves to 18-10-2-1, calculating in at a .629 win percentage, good for first place in the Pacific Division. The team’s three-game road trip will continue Saturday night when they take on the Ontario Reign at Citizens Business Bank Arena, where the puck is scheduled to drop just after 8:00 PM MST.